Home News New Release! Shake Those Bones! New Release! Shake Those Bones! Hurray! Our fifth album is here. We are back to the high seas with “Shake Those Bones“, our follow up album to “Skull and Magpies”. Ten new tunes (plus a bonus track) inspired by rogues, reprobates, romance and rum. 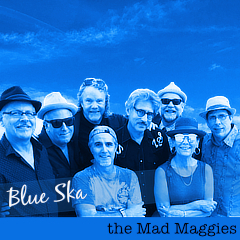 There’s shades of ska, celtic flavors, a cumbiaesque song, a cajunesque song, a song in French, a song in Irish and more. This is not your Disney pirate fare or rehashed trad — oh no. I can say with confidence that you’ve never heard anything like it. Take a listen and tell me if I am wrong. Go ahead. Be honest. The beautiful album artwork is by fine artist and illustrator, Dale Horstman (who also did the artwork on “Skull & Magpies“.) He captured the feel perfectly! We recorded at Wally Sound in Oakland, once again, to 2 inch analog tape, then mixed down to digital. Wally engineered mixed and mastered. Wally gives good sound! I recently rebuilt our music shop using BandCamp so you can now listen to the tunes in their entirety–no more annoying short snippets. AND when you decide to buy, you can download in high quality audio formats–not just .mp3s. And, of course, you can order physical compact discs, too. Shake Those Bones, the complete album, is just $9.99 for digital download and $11 for CD. Our other albums and all individual tunes have a very modest minimum price which you can augment as befits your appreciative mood. You can buy single tracks or albums. And there’s free downloads to be had. Dale Horstman, high seas rabble, luck and happenstance, music, Pirates, rogues, Wally Sound.